Popsicle is the most popular brand of ice pop in the United States and Canada. Due to its popularity, it has become a genericized trademark. 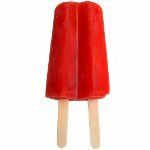 Nowadays any ice pop, regardless of format or brand, can be referred to as popsicle. Cherry popsicles are made by freezing cherry juice or any freezable cherry-flavored beverage. Homemade cherry popsicles may contain coconut milk or Greek yogurt mixed with fresh or frozen cherries. To celebrate the National Cherry Popsicle Day, you can indulge yourself with a store-bought cheery popsicle. But we suggest that you try making cherry popsicles yourself. Here is an easy recipe for you. Place 16 ounces defrosted frozen cherries in a blender or food processor. Process until smooth. In a bowl, combine 1 cup plain Greek yogurt and 2 tbs honey. Pour 2 tbs cherry puree into each popsicle mold. Then pour 2 tbs yogurt with honey over puree. Repeat until molds are full. Place popsicle sticks in molds and put in the freezer. Usually it takes at least 4 hours for popsicles to freeze.